Altering your clothes is the KEY to creating a strong personal image. Tailoring your clothes and giving them a personalized makeover is the difference between a good outfit and a GREAT outfit. When you think of people with great personal style, the chances are they have a tailor on speed dial. A tailor is like a magical unicorn who makes our clothes look amazing on us. I’m always surprised at how my clients blame themselves for badly fitting clothes when often it’s the clothes (‘it’s not you, it’s me’ type thing) and unfortunately very few women in life are a perfect 10 fit model and so to make our clothes look the best on us they can, a tweak here-and-there is money well spent, particularly if you regularly purchase on-line and it costs to return it, why not spend that money on altering it instead? Don’t think of it as ‘I’m not purchasing this item as it’s not perfect’ but instead be realistic about buying mass-manufactured clothes and if you love everything about it apart from say, the length, then alter it. 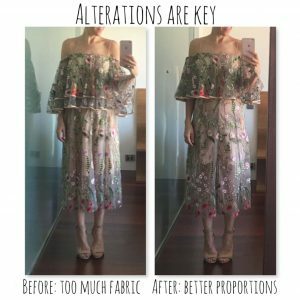 As long as the alteration is an easy one that will cost only a small amount, then it’s a win-win. You will end up with an item you LOVE, that you wear frequently, lasts you years and what’s more, you might even receive some compliments on!? Tweak the high street to create your wardrobe staples. Spot the difference! Above is an example of when I altered this gorgeous skirt & top which I fell in love with, but just had too much fabric for me (I think it was designed for a super model gazelle) so I chopped in and took it in. Now I just need the hubby to invite me on a date so I can wear it….